Heidi Montard and Steve Sanders were all child-like and carefree….and plastic and evil..while playing reindeer games all around Disneyland yesterday. Seriously, who goes to DisneyLAND anymore? DisneyWORLD is where it’s at. Disneyland is so 70’s and is probably filled with retro pedophiles. 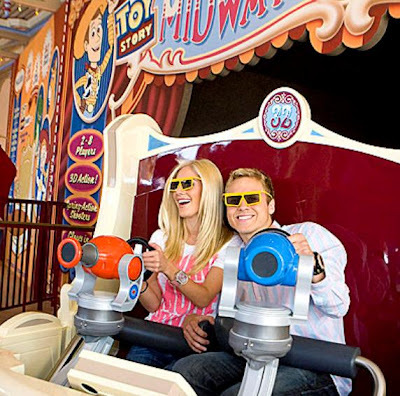 Anyway, Heidi and Steve Sanders spontaneously decided to ride the Toy Story interactive ride and surprisingly got their picture taken. I bet the little kids standing in line for that ride thought Heidi looked so real and lifelike. Sorry kids, she’s a plastic robot. The mentally-challenged duo even sported a Minnie Mouse wedding veil and a Mickey Mouse top hat and pretended they were getting married. That’s totally how the real wedding is going be. Heidi will look rodent-like and Spencer will be a rat. That was my official “Disney Clean Joke of the Day.” It was for the kids reading. You’re welcome.